Mauro Boselli scored twice to help Wigan fight back and defeat fellow Premier League side West Ham in the Capital One Cup third round. James McArthur's error let Modibo Maiga power in a shot for the Hammers. Wigan responded with Boselli converting a Callum McManaman cross and Ivan Ramis scoring with a 20-yard strike. Boselli lifted the ball over keeper Stephen Henderson for his second and Jordi Gomez scored from the spot to seal the win. The defeat is West Ham's first at home this season and came after both sides made plenty of changes from last weekend's Premier League matches. 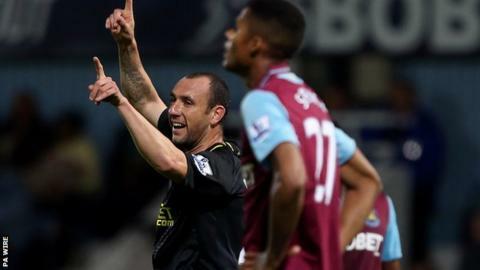 Hammers boss Sam Allardyce made nine changes to his side, while counterpart Roberto Martinez made seven. Maiga was one of those to come in for the home side and he quickly made his presence felt. McArthur was caught in possession by the Mali international, who fired into the bottom corner past keeper Ali Al-Habsi. Mauro Boselli has yet to score in the Premier League since arriving at Wigan in 2010. The Argentinian striker, who has spent half a season on loan at Genoa and a year back at former club Estudiantes, has scored all four of his Wigan goals in the League Cup. Wigan gradually improved, with David Jones having a shot saved by Stephen Henderson and Boselli heading wide. Boselli has struggled since a £6m move to Wigan from Estudiantes in June 2010 but played a pivotal role in helping his side through to the last 16. The Argentine, 27, lost his marker to get on the end of a Maynor Figueroa cross and poke the ball past Henderson for an equaliser. West Ham allowed their visitors too much time and space and that was epitomised when Ramis scored his first Wigan goal. The Latics centre-back ran on goal from the halfway line before finishing it off with a long range shot. Boselli extended his side's lead with a lovely chip over Henderson as West Ham struggled to match their rivals. The home side rarely looked like mounting a comeback and were put out of their misery when Gomez scored from the spot after Henderson had hauled down McArthur. West Ham manager Sam Allardyce: "We couldn't defend a fish supper tonight. There were howling errors from our defenders in all four goals, it was comical. Wigan manager Roberto Martinez: "We're happy with how it went given there were changes. It was a real test of character, especially from the young lads.